According to AutoBlog.com, it’s been a quarter-century since the last time Chevrolet’s reborn Camaro took down the Ford Mustang in sales but it’s on the verge of doing it now. According to AutoWeek, the Bowtie Brigade has cleared 75,685 Camaro sales through the end of November, while the Blue Oval has shifted 68,264 units. Extrapolating the monthly sales totals to the end of December, AW estimates that Chevrolet will finish 2010 with around 82,500 sales, besting the Ford’s estimate of 74,500. Trailing the muscle car pack in sales is Dodge’s Challenger lineup, trending at around 36,000 units. There has certainly been pent-up demand for the Camaro among consumers after its prolonged absence, but what’s even more impressive about its yearly sales total is that if the lead holds, the Chevy will have outsold the Ford and the Dodge with far fewer special editions and no convertible bodystyle like the Mustang. (A droptop Camaro is slated to go on sale next year, and a high-performance Z28 variant is also expected). Check out a photo gallery of both cars! This is fun to watch but where is the damn convertible Camaro? It will interesting to see what the new engines in the Stang’ will do for sales. I must say that the Mustang design has held up well over time as that will be the true test for the new Camaro! One of the toughest — and longest-running — battles in the auto industry has taken an unusual twist in recent months. But the shoot-out at the pony car corral is anything but over. Once given up for dead, Chevrolet’s reborn Camaro has, since mid-2009, become the top-seller in the so-called pony car segment, toppling arch rival Ford Mustang from its throne for the first time in nearly a quarter century. But the fight is far from over. While horsepower is certainly key to Mustang’s planned comeback, mileage rather than muscle may ultimately determine the winner in this battle. The pony car wars are heating up! The Camaro has been outselling the Mustang recently, but the new 2011 Mustang will be getting a nice engine upgrade from Ford’s Brook Park plant in Ohio. Ford Motor Co. will make a new 3.7-liter V-6 engine for the popular Mustang sports car at Cleveland Engine Plant No. 1 in Brook Park next year, replacing an engine built in Germany. The new engine, similar to one built in Lima for use in the Lincoln MKS luxury car, should go into production next year to be ready for 2011 Mustang production, said Mark Payne, vice president of the United Auto Workers Local 1250 in Brook Park. Ford says the new engine will be more fuel-efficient and more powerful than the 4-liter V-6 it replaces. That engine, built in Cologne, Germany, produces 210 horsepower and gets 26 mpg on the highway. The upcoming 3.7-liter engine produces 305 horsepower and should get up to 30 mpg on the highway. Those power numbers are only a little bit shy of the 4.6-liter V-8 now offered in the Mustang. 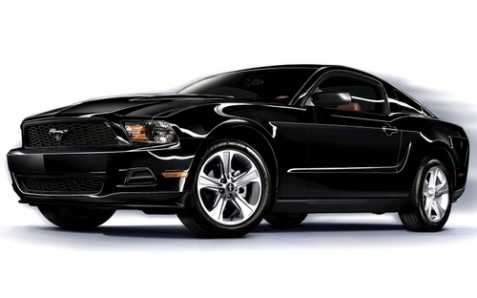 Ford will showcase the 2011 Mustang this week at the Los Angeles Auto Show. One of America’s favorite muscle cars has a new exterior design, a new world-class interior featuring well-crafted materials and updated technology including SYNC and cutting-edge navigation. It’s hard to imagine any Top 10 list that includes the Mustang II, but here it is on MSN’s new list of Mustang Mania. Today, this vehicle is universally detested by Mustang enthusiasts. As a performance car, it was a thorough disappointment. But then, the mid-’70s was an era of fuel shortages, vapid disco music and cars gone sad because manufacturers were struggling to meet new emission regulations. Therefore, the Mustang II was designed to be light, approachable and relatively fuel-efficient. The formula worked, at least at first; the 1974 model sold more than 322,000 copies — good enough for fourth on the Mustang annual sales chart. More importantly, the Mustang II was good enough to keep the Mustang brand alive during a dismal period in America’s automotive history. A couple of points should be clarified. First, disco didn’t become the rage till Saturday Night Fever hit in 1977. As for the lack of power, that was true, though I had one of these cars, and the previous owner had dropped a much more powerful engine in the vehicle, so that Mustang rocked. It was also bright red, so it looked much better than the ugly version shown above. That said, the feature has some great photos of classic Mustangs, so check it out.